GUS EDWARDS, Ravens (0.2 percent owned): The undrafted rookie surprisingly took hold of the lead role in the Baltimore backfield in Week 11, rushing for 115 yards and a touchdown on 17 carries, and now he has an apparent opportunity to continue as the No. 1 RB as the Ravens take on the Raiders. It’s a fine matchup for Edwards to continue to build on his momentum. 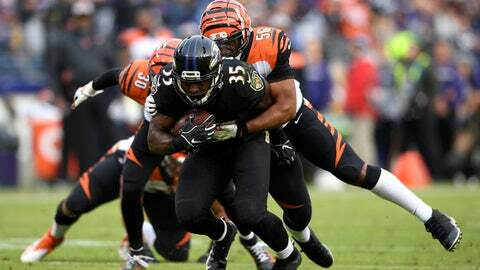 John Harbaugh does not seem to trust Alex Collins and there aren’t really other competitors for the carries. You have to take the flier on Edwards, but keep in mind the Ravens have not leaned heavily on any one RB this season yet. JOSH ADAMS, Eagles (28.1): We have recommended this other undrafted rookie previously, and 22.1 percent of fantasy players added him last week, but he remains underowned. Adams has yet to reach double digit carries or 65 rushing yards in a game, but he was on his way to officially seizing the lead RB role last week before the Eagles were blown out by the Saints. He provided Philadelphia’s only score on a 28-yard TD run, flashing his upside, and we could see his best production this week in a much friendlier matchup with the Giants. LEGARRETTE BLOUNT, Lions (9.8): The well-traveled veteran has rushed for only 16 yards in his last four games, as he became a complete afterthought with Kerryon Johnson moving into clear lead back and Fantasy RB1 territory. But Johnson is expected to miss Thursday’s game against Chicago with a knee injury and Blount should be the top ball carrier for the Lions. It’s not a good matchup against Chicago’s elite run defense and Theo Riddick is a better add in PPR leagues if available, but Blount will start for Detroit and may have to be the alternative option if you need a one-week play and cannot acquire Edwards or Adams. KEKE COUTEE, Texans (14.3): Most rookie receivers are unreliable, but Coutee seems to have a safer floor than others when he has been healthy. He also seems to be a preferred target over recently acquired veteran Demaryius Thomas, who seems to be fading into the twilight of his career. Coutee already has three double figure PPR performances in four relatively healthy appearances this year. D.J. MOORE, Panthers (32.0): He previously showed some glimpses of his considerable promise before breaking out with seven catches for 157 yards and a TD in Week 11 against Detroit. Like many first year wideouts, Moore is a risky play and can follow up a big game with a quiet one. But he has the most pure talent and potential of any Carolina WR and the opportunity to take the lead role in the Panthers pass-catching corps if he can continue to trend upward. TRE’QUAN SMITH (13.4): Because he plays in such an explosive offense, Smith could be the top add of the week, especially after registering 10 catches for 157 yards and a TD in the destruction of the Eagles. Smith seems set to be the Saints’ top pure deep playmaker for some time to come. There may be a quiet outing here and there, but it’s unlikely in Week 12 against Atlanta. JAMEIS WINSTON, Buccaneers (9.4): He Is back as the starter again, but just like the guy he replaced, Ryan Fitzpatrick, he has a lot of upside with big risk. Winston threw four TD passes against the Falcons in Week 6 and was intercepted four times by the Bengals in Week 8. The matchup vs. the 49ers this week can inspire confidence, but he’s a roller coaster ride vs. any opponent. Taking Winston is advised if you need to replace Patrick Mahomes or Jared Goff and the waiver wire is very thin at QB, If you have a backup with a safer floor, you may want to stick with that. BAKER MAYFIELD, Browns (37.5): Mayfield is a very good replacement for Mahomes or Goff, and may not melt like Winston when you need him to be stable. Mayfield has thrown nine TD passes in his past four games, with two TD passes in three of them and three vs. Atlanta before last week’s bye. He has a friendly matchup vs. Cincinnati this week. CAMERON BRATE, Buccaneers (8.9): Brate has faded into the background recently with the ascension of O.J. Howard, but a knee injury has clouded Howard’s outlook for Week 12. If Howard is out or limited against the 49ers, Brate could re-emerge as a prime TD threat for Winston, who has favored him often in scoring situations in the past. CHRIS HERNDON, Jets (6.6): This rookie does not have much upside, but he caught TD passes in three consecutive games from Weeks 6 to 8 and then caught four passes for 62 yards in Week 9. Herndon may not hurt you this week and is obviously a threat to score. The Jets passing game has looked bad lately, but if they can show respectability against New England, Herndon should be involved somehow.